Boutique – lends an air of sophistication to an otherwise unobtrusive store. 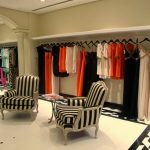 Generally dealing in apparel, boutiques are considered high-end fashion stores serving clientele with that quintessential aura of sophistication. As a boutique attends to a specific form of couture, the interior will be contingent with it. Whether casual, trendy; menswear or ladies garments and accessories; formal wear; kids wear, beachwear etc. Digg Interior fashion gurus will envisage your store and allow you to view a complete visual prior to your actual set-up. Lending the much needed assistance to help boost your sales from day one. Surf our e-brochures and catalogues to find the kind that suits your fashion sense and we will build a brand that talks for you. Smart, innovative window displays. Light and décor combines. Safe and convenient shelves and racks. Private changing rooms with secure systems. A tapestry of colour shades, designs and textures to blend with the attire. Strategic placement of security cameras and check-out counters. Ease of browsing comfortably and confidently. At Digg Interiors our work does not end with a onetime set-up, but our package deals are cut-out to help with the seasonal preening at festive occasions. Discover our bargain deals and have a great sales experience every day.